Barry Andrews is CEO of GOAL, the Dublin-based international aid agency. GOAL has been working inside Syria since October, 2012. It employees 350 staff in Syria, and is currently delivering aid to circa 700,000 people every month. I support the call for a no-fly zone over Syria, as a measure of last resort, and with certain caveats. How detached the world has remained from the conflict in Syria can be gauged by the fact that no longer has anyone any idea of the true casualty figures. According to the UN “over 220,000 people have been killed and almost one million injured”. Similarly, there are supposedly “four million Syrian refugees, and 7.6 million people internally displaced”. These are all freely acknowledged as mere guesstimates, with the actual number in each case being much higher. What is not in dispute, however, is that horrendous war crimes have been and, on virtually a daily basis, continue to be perpetrated on civilian populations in Syria. Helicopters drop barrel-bombs on heavily populated areas or, as happened only three weeks ago in Darkoush, on crowded marketplaces. The use of chlorine bombs, the fumes of which are particularly deadly for children and the elderly, is now so commonplace as to barely rate a mention on our news bulletins. Decisive action has to be taken to bring some relief to the people of Syria. 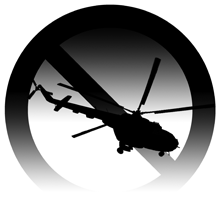 In the short to medium term, until a political resolution can be found, a no-fly zone seems the only available option. It would go some way to helping provide a breathing space for the people. To have any real effect such a zone would, self-evidently, have to be rigidly enforced. For that to be feasible, it would need to enjoy the support of a broad coalition of Arab, Western and other states. We can’t ignore the danger that if a no-fly-zone was confined to only certain governorates or cities, the aggressors would simply shift their deadly attention elsewhere. A no-fly zone should be time-bound, with solely humanitarian objectives, rather than military or overt regime change as its objectives. Rather, the pause provided by a no-fly zone should be used to aggressively pursue a political solution to the conflict. The obfuscators and, critically, the quiet supporters of one aggressor or another, must be left in no doubt that everyone is expected to push for a political resolution. A no-fly zone should not be considered a solution, but primarily as a means of allowing organisations like GOAL to expand our operations - to allow us safely deliver aid and respite to civilians right across the country, rather than to only those living in relatively safe pockets. However, it must also be a means to an end. A political end to a conflict that, for every day it is allowed continue, brings terrible suffering to the people of Syria and shames the rest of us.